Originally posted in Drexel Now. While the Philadelphia Eagles were flying high to victory at the 2018 Super Bowl, Drexel Dragons were busy helping to promote the Eagles and plan Super Bowl festivities. A number of Drexel University students were at the big game as part of their co-ops, while a few professors were involved with behind-the-scenes action on one of the biggest nights on television. And back in Philadelphia, the Drexel community came together to share their support for the hometown heroes. Joseph Roche, an entertainment and arts management major with a sports concentration in the Westphal College of Media & Arts Design, worked at the Super Bowl as part of his job as a production assistant with Touchdown Entertainment Inc. He was on a team of over 400 that set up and took down the stages used during Justin Timberlake’s halftime show (which he watched from the Eagles’ end zone). When he applied for the Super Bowl gig in November, the Eagles had been playing well — but Roche had no idea then that his hometown team would be playing at that same Super Bowl (or that they would win!). While in Minneapolis, Roche networked and built up his industry connections and learned how to work on and communicate with a huge team for an even bigger event. Pranali Jagasia, a pre-junior communication major in the College of Arts and Sciences, has been on co-op with a marketing internship for the entertainment groups at the Eagles, including the Eagles cheerleaders, Swoop the mascot, the drumline and pep band. On the job, she’s been booking, managing and attending appearances with the entertainment groups, and also helped put on signature Eagles events, she said. Plus, she got to work all the home games this season. Jagasia cheered on the Eagles at the Super Bowl, where she attended the game and some pre- and post-game events as a fan. As previously featured in DrexelNow, the Center for Sport Management’s Victoria Louca, a pre-junior sport management major, went to the Super Bowl as a marketing intern for the Philadelphia Eagles. “All I can really say for now is just the fact that the team that I’ve been following since I was a little girl is going to the Super Bowl, let alone the fact that I am an intern during the season that they are doing this, is an incredible, once-in-a-lifetime experience that I am so grateful to have and will absolutely never forget,” she told DrexelNow last week. Her fellow sport management major Jawan Hunter also worked as a corporate sponsorship sales and service co-op with the Eagles these past two terms, and he cheered on the team at the Super Bowl with Louca. During his co-op, he coordinated with other interns and staff to host events, including game day festivities and a special event called “Partners and Power Wheels” where Eagles corporate and community partners came to Lincoln Financial Field to help put together small motorized vehicles for young children with disabilities. “It was special because I got to be involved with it from the beginning and to see everything come together at the end and to see how appreciative everyone was felt very rewarding,” he said. There were also two Drexel Dragons cheering from the sidelines as Eagles cheerleaders: Marissa Hill, an undergraduate communication student in the College of Arts and Sciences, and Sage Cifaloglio’14, a LeBow College of Business graduate who has been a member of the squad for six years. DrexelNow previously featured Cifaloglio in a 2012 article when she first made the team and followed up the next year when she and her twin sister Gabriella, who graduated from the Westphal College of Media Arts & Design in 2014, both made the squad. Karen Weaver, PhD, associate clinical professor in the Center for Sport Management, went to the Super Bowl as a guest of NFL Films. In addition to touring the media set-up at the stadium and in the staging areas, she also attended a technology “Shark Tank” presentation that was exclusive to NFL Management. During her experience in the stadium, she posted a lot to her Twitter account — including a Super Bowl selfie with Eagles owner Jeffrey Lurie. She also reconnected with sport management alum Evan Sacks, who is doing a yearlong post-graduation internship with the Minnesota Vikings. Don Haring, an adjunct professor in the Department of Graphic Design in the Westphal College of Media Arts & Design, is also a storyboard artist — and was involved with ads for Bud Light’s Dilly Dilly and Avocados From Mexico that were aired during the broadcast. 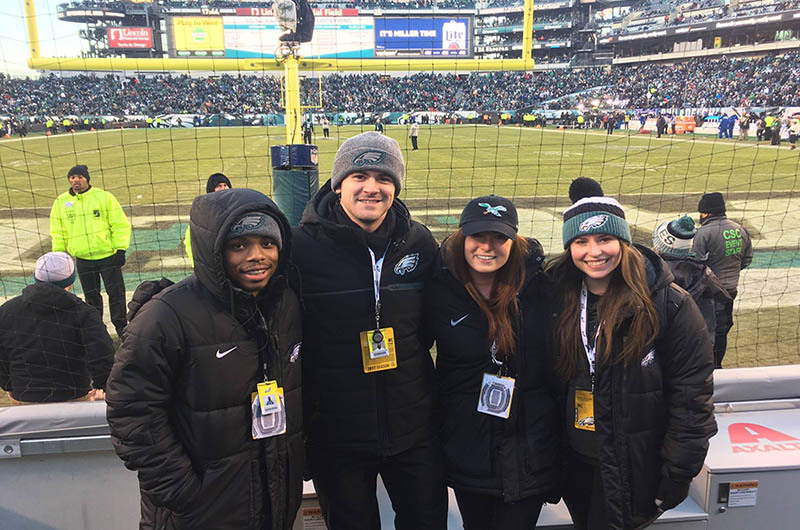 Center for Sport Management undergraduate student Benjamin Kaminsky, who is taking over Hunter’s position as a corporate sponsorship sales and service co-op with the Eagles during the spring/summer cycle, attended the big game as well — as a fan. Fellow sport management majors Dylan Campbell and Alex Norcross also headed to Minneapolis to watch the game as fans. After the game, Drexel President John Fry congratulated the Eagles in a video. James Spotila, PhD, L. Drew Betz Chair Professor in the College of Arts and Sciences’ Department of Biodiversity, Earth & Environmental Science, with the Eagles cupcakes he brought to his “Endangered Species Conservation” class. But before the Super Bowl, Dragons switched from blue and gold to all things green to support the Eagles. On Tuesday, James Spotila, PhD, L. Drew Betz Chair Professor in the College of Arts and Sciences’ Department of Biodiversity, Earth & Environmental Science brought in special Eagles cupcakes to his “Endangered Species Conservation” class (where, yes, the American bald eagle was discussed!). “It let me bring the football fever to the classroom and reinforce what I’m teaching,” he said. The cupcakes, purchased from Ponzio’s diner in New Jersey, featured chocolate wings that Spotila said were a big hit. The Academy of Natural Sciences somehow managed to fit an Eagles shirt onto a dinosaur (size XXXXXXXXL?). After all, birds are related to dinosaurs, right? The humans at the Academy (and another dino in an Eagles shirt!) also came together to cheer on the Eagles with “Fly Eagles Fly,” which was included in a music video roundup of local cultural and historic institutions. The staff at the Goodwin College of Professional Studies dressed up in green on Friday. And that’s all before the Eagles parade! Before she even started her marketing co-op with the Philadelphia Eagles in the fall, Victoria Louca, a pre-junior sport management major in the Center for Sport Management, had already scored. Promoting the NFL’s Pro Bowl game on Jan. 28 were some of Drexel University’s all-star graduate students in the online M.S. in Sport Management program within the Center for Sport Management.